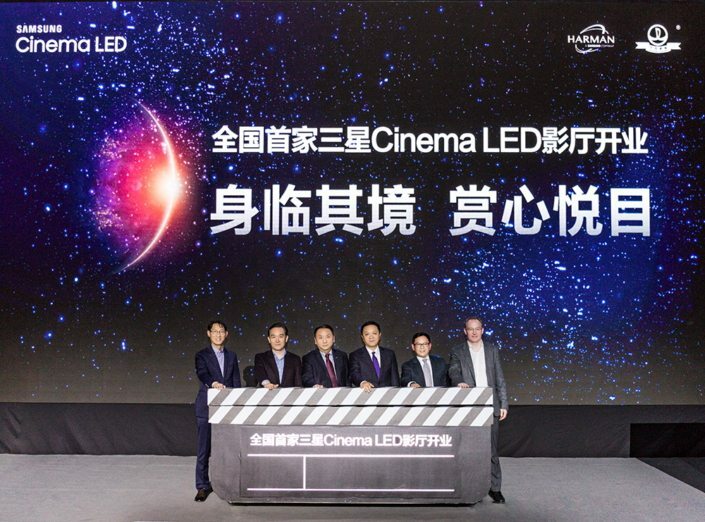 Samsung Electronics today announced a partnership with the world’s largest theater operator Wanda Cinemas to bring its pioneering Cinema LED Screen technology to Wanda’s Wujiaochang theater, located in Shanghai’s Yangpu District. The theater marks the first implementation of Samsung’s Cinema LED Screen in China, and follows successful implementations in Asia last year in Seoul and Busan, Korea, and Bangkok, Thailand, and also in Europe, at the Arena Cinemas Sihlcity in Zurich, Switzerland. The new partnership expands Samsung’s relationship with the world’s leading cinema chain. A Fortune 500 company, Wanda Cinema Line Corp. operates nearly 14,347 screens at more than 1,352 theaters around the world, and also owns recognizable global cinema brands including AMC, Carmike, Odeon and Hoyts Group. Even as Cinema LED at Shanghai’s Wujiaochang theater launches, Samsung and Wanda Cinemas already are finalizing a second cinema conversion in Beijing, with plans to open the venue to the public in the first half of this year. As the world’s first Digital Cinema Initiatives (DCI)-compliant High Dynamic Range (HDR) LED theater display, Samsung’s Cinema LED Screen delivers excellent visual quality, technical performance and reliability that surpass that of legacy projector-based operations. Stretching nearly 10.3 m. (33.8 ft.) wide, the Cinema LED Screen fits comfortably in usual theater configurations, maintaining the same stunning picture quality at even the widest viewing angles. The display also transforms content with ultra-sharp 4K resolution (4,096 x 2,160) and peak brightness levels nearly 10 times greater than the typical cinema standard. As a result, viewers can experience more immersive content supported by bright colors, pristine whites and deep blacks. To go with the stunning picture technology, Samsung has paired its Cinema LED Screen with state-of-the-art audio technologies from JBL by HARMAN. This integration includes powerful speakers bordering the screen, and an expanded audio “sweet spot” throughout the theater’s seating area, producing a true multi-sensory experience the way the content creators intended. With the demands for theater space evolving across the industry, Samsung’s Cinema LED Screen will enable Wanda Cinemas to expand the service offerings inside its improved Shanghai theater. The display’s consistent presentation, even against dark or ambient lighting conditions, accommodates non-movie content including gaming competitions, corporate events and presentations, and sports and concert simulcasting, among others. 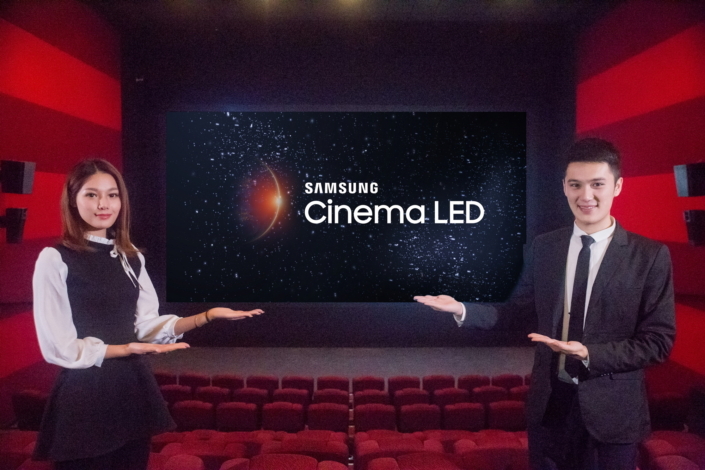 For more information about Samsung’s Cinema LED Screen, as well as related articles, photos and videos, visit http://news.samsung.com. (top image) On February 4, the launch ceremony of the first Samsung Cinema LED of China was held at Wujiaochang’s Wanda Theater in Shanghai, China. From left, Jason Kim, VP of Samsung Electronics Visual Display Business, Yontak Jin, VP of Samsung Electronics China Consumer Elecronics Division, Wang Qi, CTO of Wanda Cinemas, Zeung Guang, VP of Wanda Cinemas, Frank Xiao, VP of HARMAN China Enterprise Business and David McKinney, VP of HARMAN.